The Daily Gourmet: Bring on the grill! May has got to be one of my favourite months - if for any other reason than it's usually the PERFECT weather for grilling out! One of my activities for the month of May was to use a recipe from the Memorial day collection at Allrecipes.com. 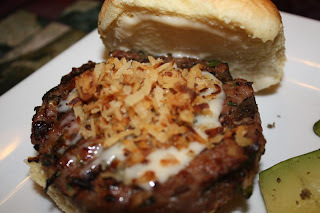 I've always been one to push the edge w/ my cooking, so when I saw the recipe for the Crunchy coconut and lime burgers I knew I had to try it! First thing I knew was that I would NOT add the salt as the soy sauce is MORE than salty enough. Next I left out the egg. I didn't see the purpose in adding the egg. I was in shock with the amount of mayonnaise the recipe called for and I dropped it to a max of 2 Tbsp per burger. Next up...taste test! These were given great reviews by my friends at the gun range! Perfectly seasoned, flavourful, and the carmelised coconut was a perfect touch! Absolutely a burger made for the grill!